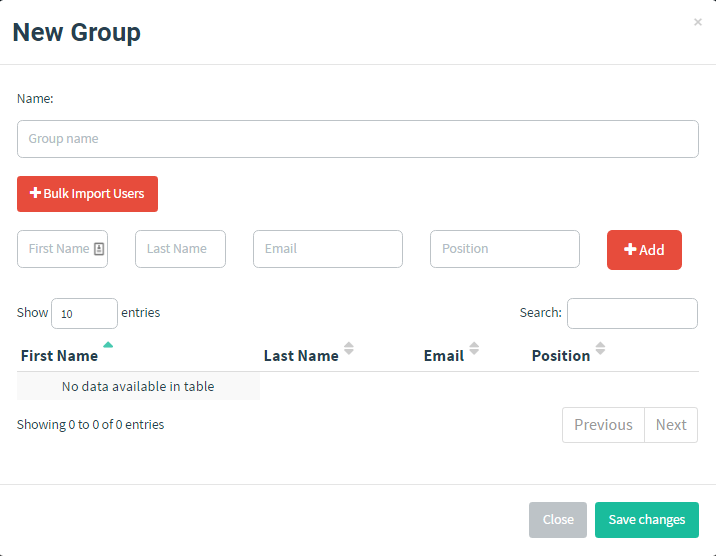 Gophish lets you manage groups of users targeted in campaigns. To create a group, first navigate to the "Users & Groups" page in the navigation menu and click the button . To add a group, you need to specify a unique group name, as well as at least one recipient. To add users manually, fill in the text boxes for "First Name", "Last Name", "Email", and "Position" and click the "Add" button. Adding users manually can be a pain. To fix this, Gophish lets you upload users in bulk from a CSV file. To upload a CSV with user information, click the "Bulk Import Users" button and select the CSV you want to upload. Users are then uploaded and displayed in the dialog. To save the group, click "Save changes".